One of Steve Sailer’s themes seems to be “affordable family formation.” In the link, Sailer lays out a theory of housing prices: expensive in coastal cities because they can only expand on the landward side; really expensive in “paradises” like Hawaii and (to a lesser extent) California; cheap in “dirt” states where cities can expand in all directions. He sees “affordable family formation” as one of the main factors in making a state vote Republican. And he sees restricting immigration as a means of keeping housing prices down and family formation affordable. Partisan goals aside, it’s surely desirable for people to be able to afford to form families. In denying that land is scarce, I refute one critique of immigration, but you might suppose, I also forgo an argument for immigration, namely, the land value windfall for native Americans when immigration increases demand for the land they own. Surely I can’t claim that immigration benefits American homeowners by raising housing prices, yet at the same time doesn’t harm American non-homeowners by raising the housing prices they’ll face when they want to buy. 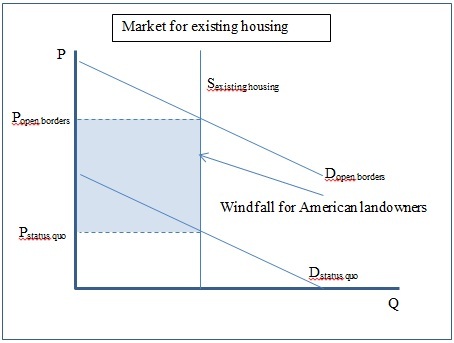 The supply curve of new housing is horizontal because the land it’s built on would be basically free, being taken from farming activities, and the construction cost is constant. Actually, the construction cost would probably fall under open borders, given the abundance of low-wage homebuilders that would be available, but never mind. Since supply of new housing is perfectly elastic, the increase in demand would not raise housing prices at the margin. 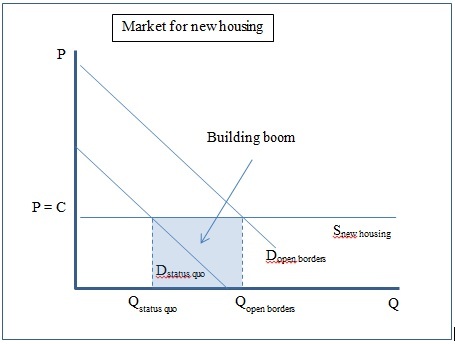 As quantity rose from Q (status quo) to Q (open borders), there would be a building boom. Why would people pay the high prices shown in Figure 1 for existing housing, when new housing is available at P=C? Location, location, location. As cities would expand outward, the existing housing stock would be more central, and consequently more desirable, so it would command high prices. But in that case, wouldn’t American non-homeowners, even if they could still afford homes as easily as before, be pushed into less desirable locations. Not really. After all, why is urban land desirable in the first place? Density. The land per se is usually nothing special, but it’s valuable to be able to plug into the networks of specialization and trade that the city provides. Well, as cities expanded to accommodate immigrants, they could provide as much of the benefits of density to the new housing as they previously did to the old housing, even as they provided even more of these benefits to existing housing. So American non-homeowners would be held harmless even as American homeowners enjoyed a large windfall. 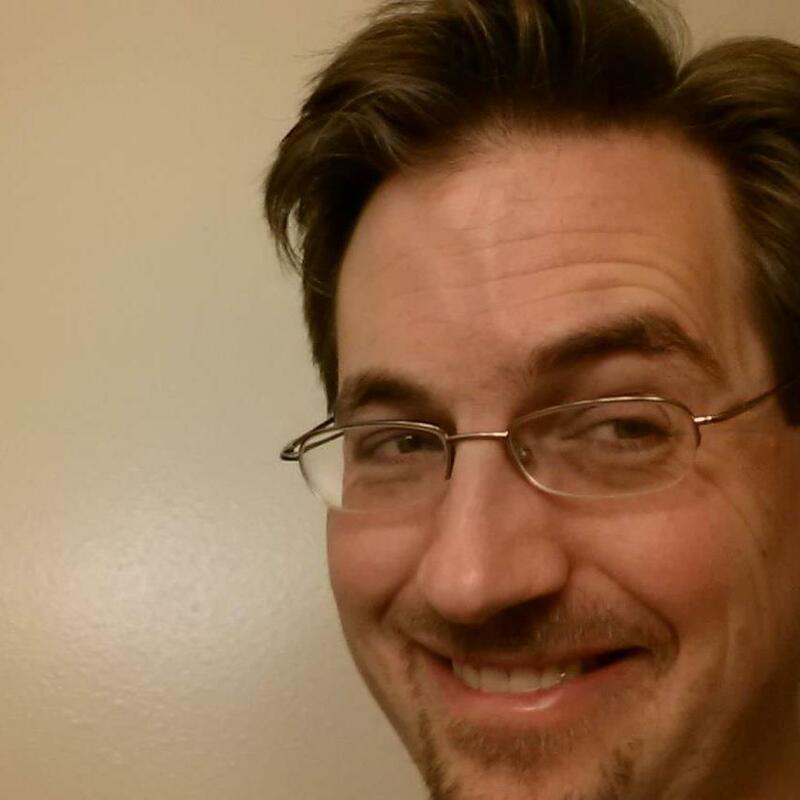 Of course, I’m simplifying. The supply of new land for home building isn’t always perfectly elastic. Some city sites, like San Francisco, really are uniquely beautiful and special. That said, the almost uninhabited coastline north of San Francisco is beautiful, too. Meanwhile, many other city sites– Indianapolis, say, or Denver, or Fresno– really aren’t very special. Older cities have special historic monuments. It’s possible that the new urban space called into being by the open borders building boom would be drab and lacking in character, though on the other hand technological modernity plus immigrant new perspectives might make them especially exciting. Even then, though, there would be adjustment pains, and probably in some places family formation would become less affordable. By and large, though, the effect of immigration on land values is, if not a win-win, a win-draw: homeowners gain, non-homeowners are held harmless. The wealth effects of the land value windfall would be not only large, but widely distributed. As of 2009, over 67% of American households owned homes. Last year I believe the Spanish government announced just such a visa. Unfortunately both the Spanish proposal and similar ones that have surfaced in the US government don’t grant homeowners any more than the right to live in their own home, which somewhat defeats the point of buying a home (though this is probably less of an issue in Spain, given its popularity as a holiday/retirement destination and the current state of its labour market). The great land value windfall from open borders is licensed by Nathan Smith under a Creative Commons Attribution 3.0 Unported License.